We heal from the inside out. It’s no secret that our exterior mirrors our interior. Eating dark, leafy greens is the safest way to heal with food. These foods clean out the system, promote healthy skin and can even reduce sun damage. Studies show that diet really does impact complexion. There’s also a correlation between dairy and acne. It’s something to think about as you make diet changes and cut back on the sugary foods that may actually be clogging your pores and raising insulin levels. Here are some skin-friendly foods to pick up at the grocery store for a radiant glow! Sweet potatoes imply sweetness but really they provide a mecca of nutrients for skin. High in beta carotene and antioxidants, sweet potatoes can give skin a lasting glow without the influx of heavy carbohydrates. They’re better suited for winter weather as they help retain nutrients in your system. Steam and eat plain to avoid added fats that golden potatoes have. Oh, what we would do for an avocado right now! Vitamin C and vitamin E are the magic nutrients in avocados. Not only do avocados great face masks, they’re also great for healing skin from the inside out. Avocados contain between 2 and 6 micrograms of biotin (which we know from our own research is good for skin). Enjoy as a light snack in the form of guacamole or as a topping on a sandwich. Almost every type of nut is good for skin. 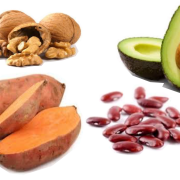 If eaten raw (meaning there are no added flavorings or high amounts of sodium), nuts add omega 3 fatty acids to your diet. They’re also a great source of UV protection. What’s even better? They’re versatile. You can eat them in just about everything. Walnuts in particular help strengthen immunity and bone health, which are all contributing factors to radiant skin. We could classify sunflower seeds in a similar category to nuts. Sunflower seeds are obtained from the center of the sunflower, which so eloquently denotes its name! Sunflower seeds do it all: they’re fat-soluble, an active antioxidant, help promotes cell formation and lower cholesterol. The cell formation is worth noting: sunflower seeds are said to stimulate skin growth. Kidney beans are especially high in zinc, which is great news for your skin. Vitamin C and A are found in most types of beans. They’re high in calcium and make the perfect snack. Even green beans fit into this category! Green beans contain the carotenoids lutein, meaning they’re a natural fix for anti-aging. Roast for a simple potato-like treat or boil with salt and pepper for a dinner side. Tomatoes. We have the great debate on whether they’re a fruit or a vegetable. Whichever they are, they hold benefits to naturally radiant skin. Tomatoes protect against UV rays and they boost elasticity and collagen production. With the right combination, tomatoes can help reduce signs of acne scars. A little tomato paste goes a long way! Does Washing Hair With Oil Really Work? Oil and water certainly can’t mix. Can your hair and oil mix? 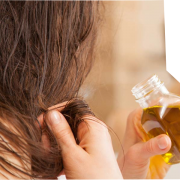 Recent studies behind using oil as a hair care product or even as shampoo have gained popular attraction. While many of us would steer clear of using oil, many believe in the natural and holistic healing qualities of oil. While it may seem like a big step to switch from traditional shampoo to oils, keep in mind that oils are more natural with less chemical and by-product. Sodium Laureth Sulfate (SLES) are also found in shampoos. It’s a chemical that can be irritating to skin. There’s no necessarily evidence claiming sulfates cause cancer, but less is more. Less ingredients pave the groundwork for less harmful chemical contamination on the skin. Over-washing and over-conditioning can lead to greasy hair and greasy hair is one reason people are less inclined to use oils as a replacement for shampoo. Before switching to an oil-based hair, consider going without conditioner for 2-3 weeks. Let your hair fully decompress from over-washing and over-conditioning. The properties of oil decrease the splitting that can occur with regular shampoos. Sodium Lauryl Sulfate is an ingredients in traditional shampoos, which is said to spread to other areas in the body such as the kidneys. Jojoba oil: jojoba oil is the grand king of oils. Typically used to help hydrate hair follicles, which helps decrease hair loss. Jojoba oil does not tamper with the scalps natural oils. Jojoba oil has similar molecules that help balance Jojoba oil can give the appearance of greasy hair if used in large quantities. To start, mix a few drops of jojoba oil to your regular shampoo and experiment with the look and feel once applied to your hair.Vitamin A, Vitamin B1, Vitamin B2, Vitamin B6, Vitamin E are all active benefits of jojoba oil. Try and buy an odorless and colorless bottle as that will be the simplest and purest form. Avocado oil: Avocado oil stimulates blood flow when massaged into the scalp. It’s a nice change in that it uses the natural fats found in avocados to assist with natural flow in the scalp. Avocado oil is a natural dandruff remover – good for treating dandruff over a period of time. Use sparingly as avocado oil can be heavy. Argan oil: Argan oil is most notable for its sleek factor. Argan oil can be massaged into the scalp after a warm shower. For styling purposes, it’s best to add a thin layer of oil in the morning before your day. Pure Argan oil comes from the trees of Africa so buying the purest and simplest form of argan oil is best. Agave oil hair treatment: Agave does the gamut of all things hair. It volumizes, straightens curls and decreases the overall greasy appearance over time when used properly. Distribute the agave throughout the hair from the scalp to the tip of the hair follicle. A little goes a long way as it is a powerful oil. Pomegranate seed oil: Now this is one that’s less common but has powerful healing capabilities. This oil is a little thicker and more expensive, but worth a try if you’re looking for premium quality oil. Try adding a few drops of pomegranate oil to water at first to help your scalp adjust. Using oil as a shampoo replacement can be a viable option if you start slow and ease your way into a regular hair care and oil treatment. It is by no means something to glob into your hair. Instead, start slow by adding oil to water and creating a mixture before completing committing to go shampoo-less. https://edenssemilla.com/wp-content/uploads/2017/02/Hair-and-OIl.png 600 852 edenmaster https://edenssemilla.com/wp-content/uploads/2016/10/edens-logo.png edenmaster2017-02-13 12:08:412017-02-13 12:08:41Does Washing Hair With Oil Really Work?